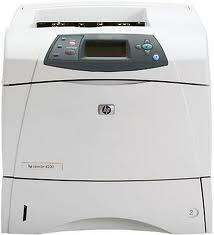 Q2426A HP Laserjet 4200N Printer - Refurbished with 3 months Return To Base Warranty & Working Consumables. The HP Laserjet 4200N Printer is as good as buying new as all worn parts are replaced. This saves you up to 50% off the price of a brand new printer. We are confident that you will be 100% satisfied with your HP Laserjet 4200N Printer and are here to help with any support questions you may have. The Manufacturers part number/product code for this item is: Q2426A. Built with HP best-in-class engineering, HP LaserJet 4200 series printers give workgroups a worry-free solution for getting the job done quickly. Flexible paper handling reduces user intervention—customizable options allow up to a 2,600- sheet input capacity, a duplexer for two-sided printing, or a 500-sheet stacker or stapler/stacker as your paper-handling needs grow. Print on the media you need to run your business—supports a wide range of media sizes for businesses including letter, legal, and custom sizes. Powerful workgroup solution—share fast, reliable printing with the available hp jetdirect 615n Fast Ethernet internal EIO print server, with 4.5 MB/sec network throughput and best-in-class security features; the optional EIO interface can also be used with many partner solutions within virtually all network environments. Save time with remote management—an embedded Web server (optional on 4200 model) provides direct access to the printer on the network and allows full control to remotely configure device settings and e-mail alerts, monitor status, and diagnose device problems. Intuitive technology makes troubleshooting quick and easy—four-line graphical control panel with Help features makes probl em resolution easy and fast. Simple operation and paper loading—paper-size sensors and easy-to-load trays without troublesome corner tabs make adding and changing media effortless. Fast printing increases office productivity—maximize efficiency with ultra-fast printing up to 35 ppm for letter-sized documents. Get quick return to application and fast printing of complex documents—powerful printing with no slowdowns using the 300 MHz processor and 48 MB RAM (64 MB RAM in bundles). Printing delivered when you need it—no warm-up time with an instant-on fuser that prints first page out in under 9 seconds. Deliver business-quality documents at full speed—even at the printer's fastest speed, you can print sharp, clear documents using the best print quality of 1200 dpi.